Temporarily closed due to road closure as of Feb17: 37°56'11.5"N, 122°38'16.9"W (I suggest Google street viewing ahead of time, as your phone will probably lose reception 1/2 mile before the trailhead). 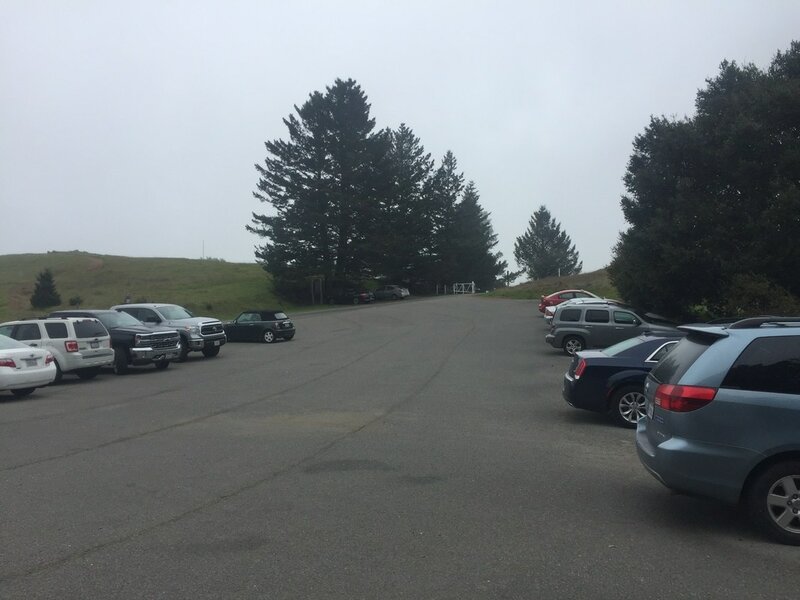 Parking: Free parking lot a the first address. 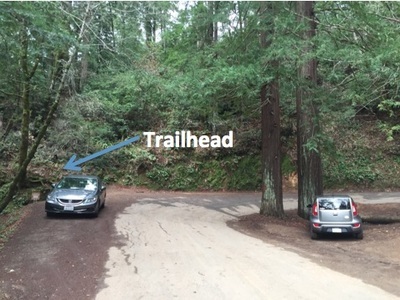 Free street parking available at the second address above, you'll see a sign for the trail head on your left at a sharp right bend in the road. 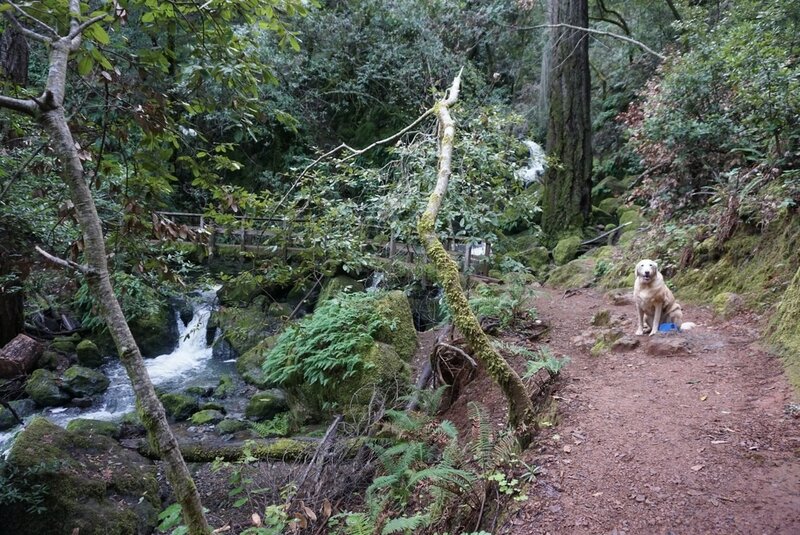 Regulations: Dogs allowed on-leash. 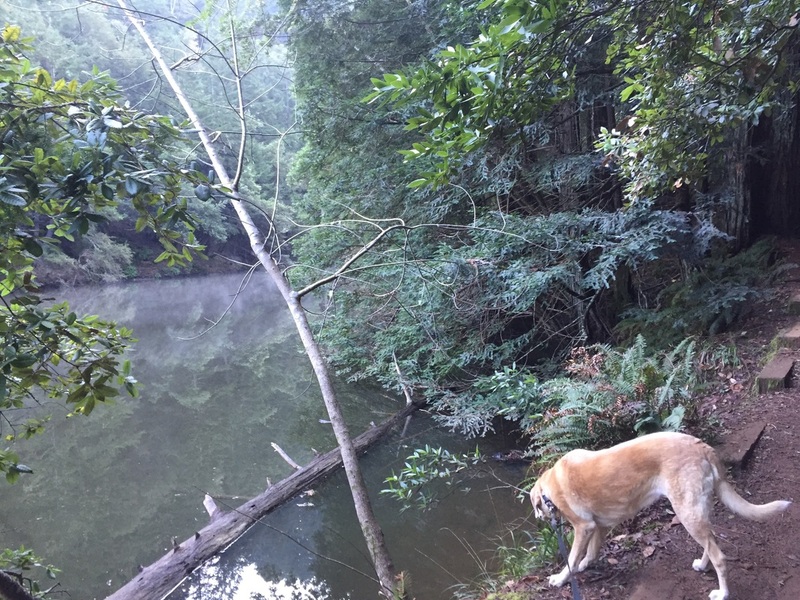 Swimming is not allowed. 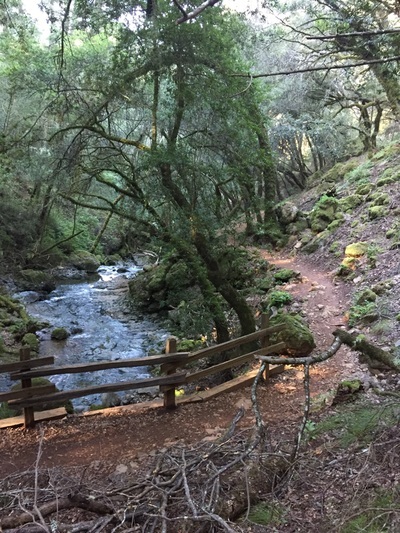 UPDATE: As of February 2017, Fairfax-Bolinas Rd is closed. 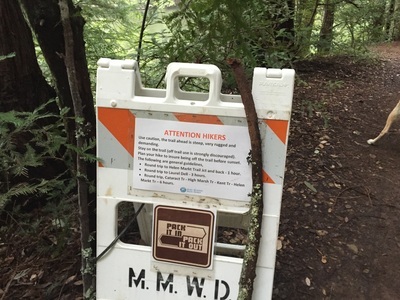 You will have to take West Ridgecrest Blvd to reach the trailhead mentioned below. This road is only open 9AM-Sunset. 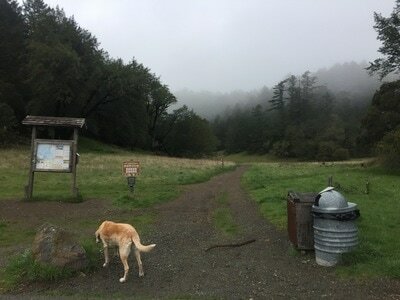 If you wish to go earlier, start at the trailhead at the intersection of Pan Toll Rd and Ridgecrest Blvd. There is a large parking lot with free parking here. 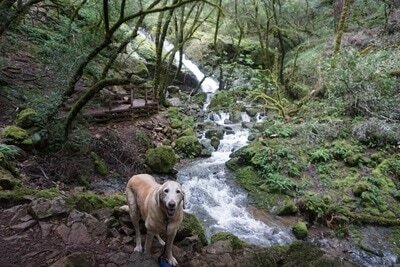 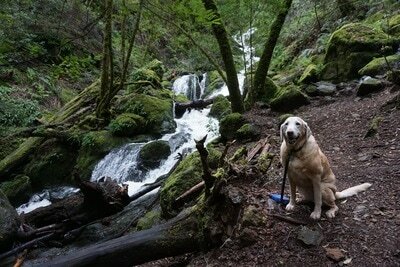 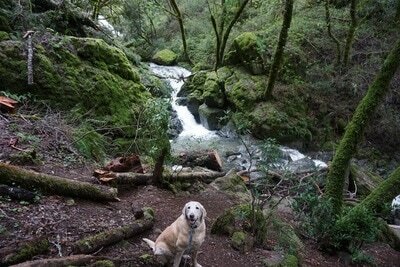 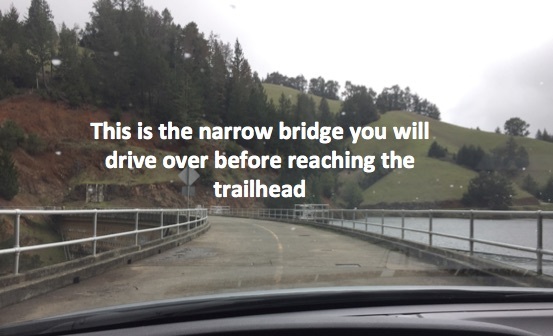 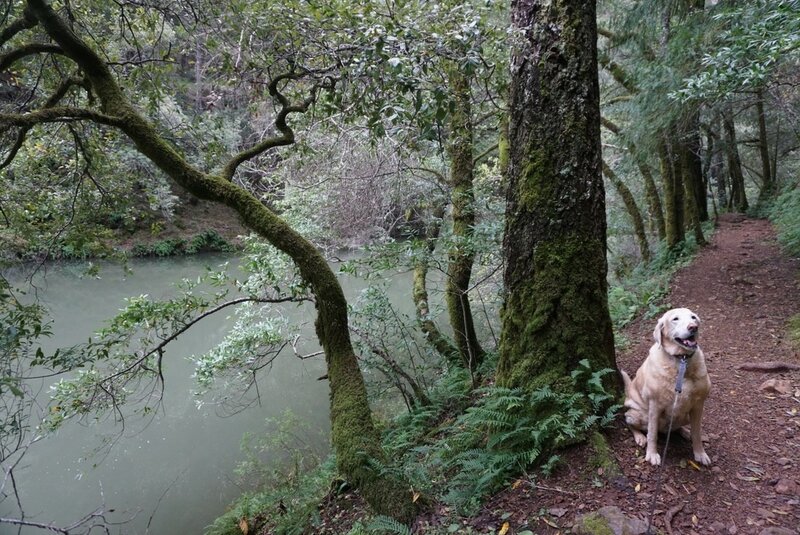 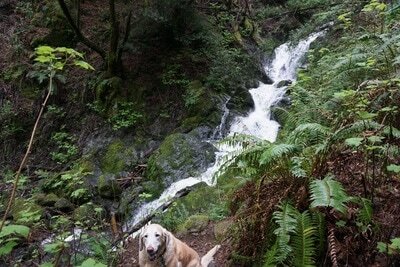 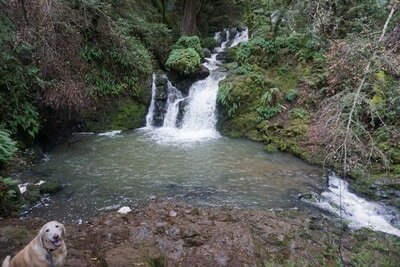 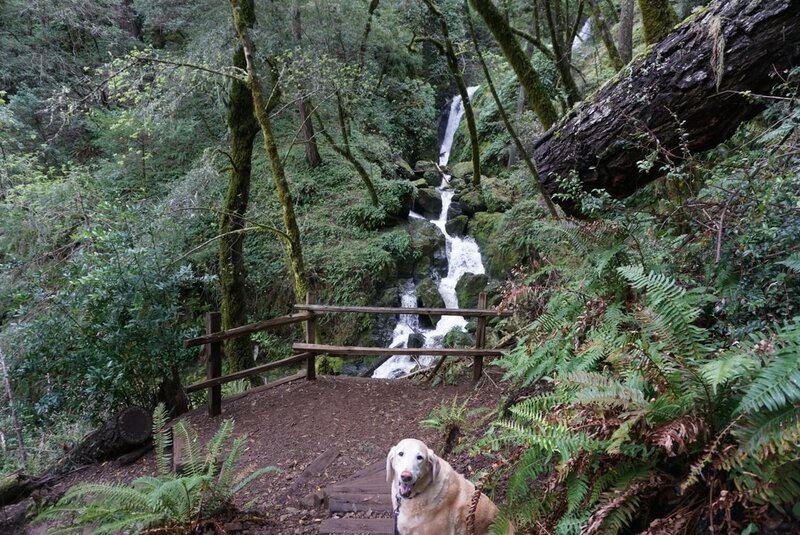 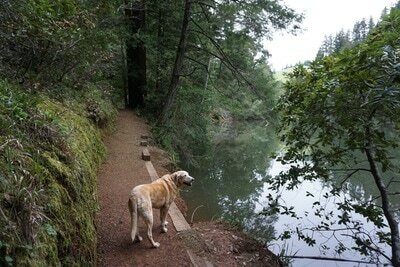 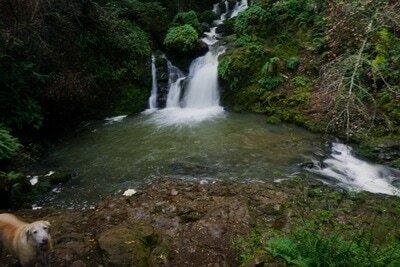 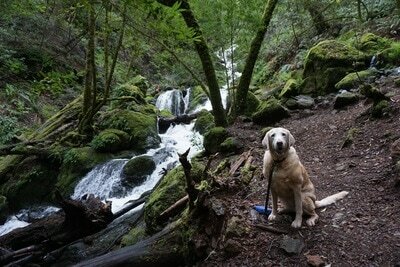 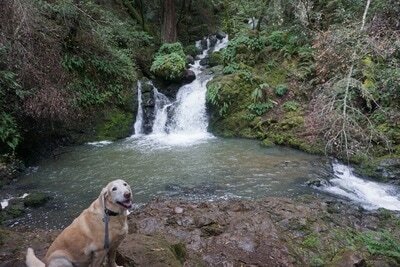 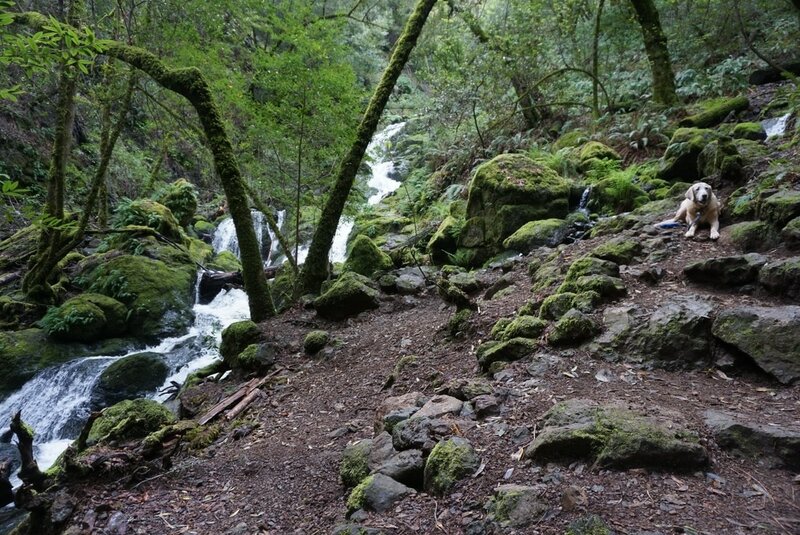 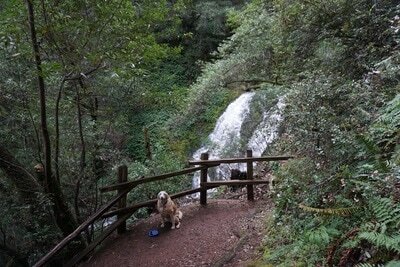 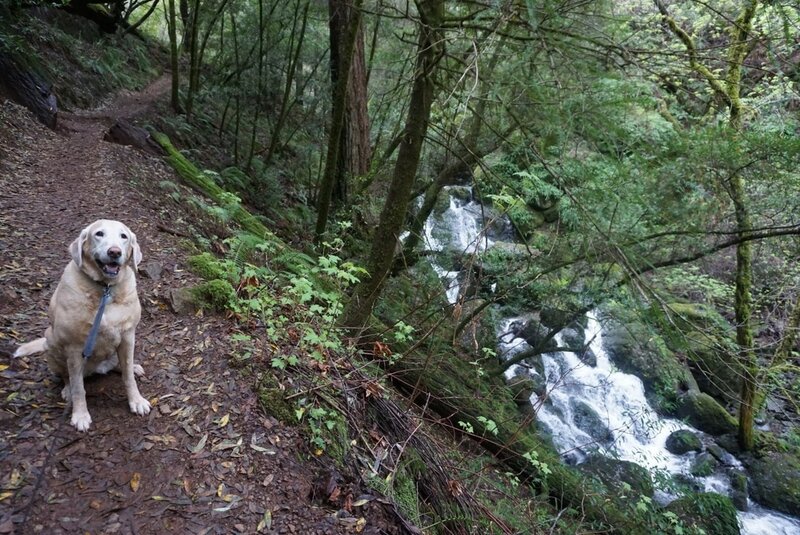 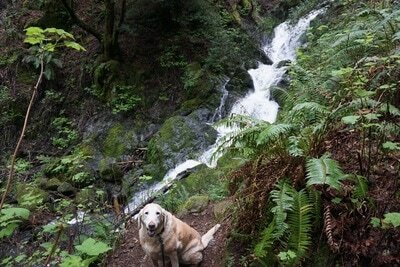 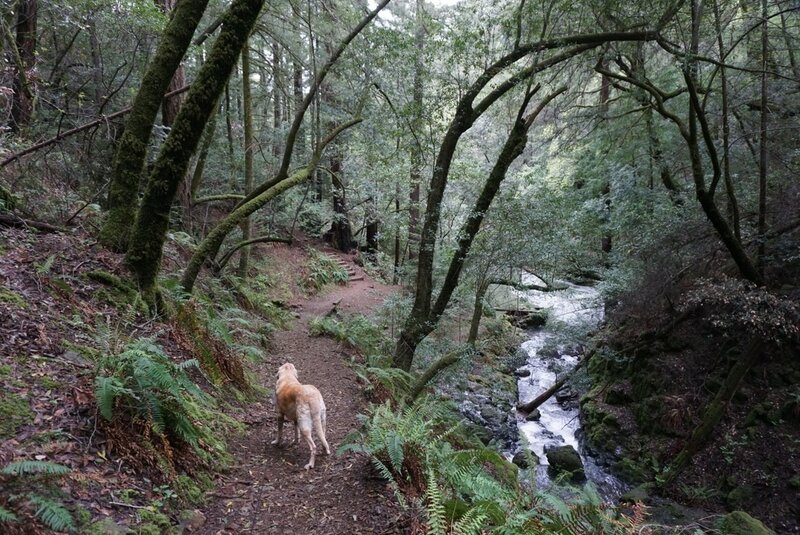 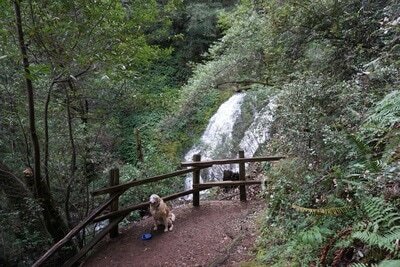 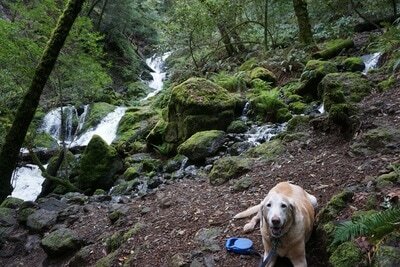 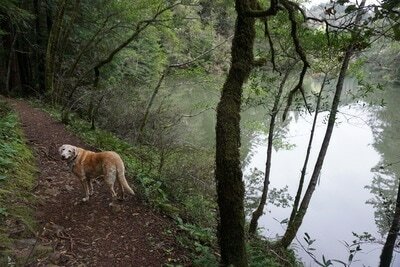 You will be hiking Cataract trail from the top down. Hiking down to Alpine Lake and back is about a 9 mile hike. 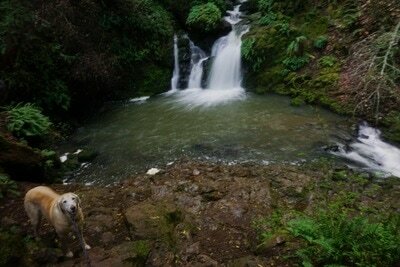 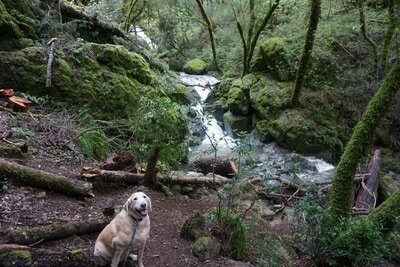 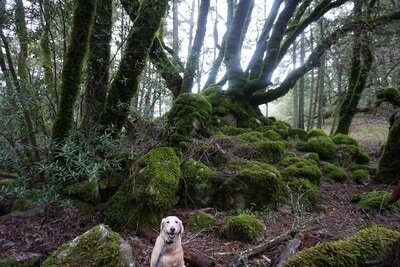 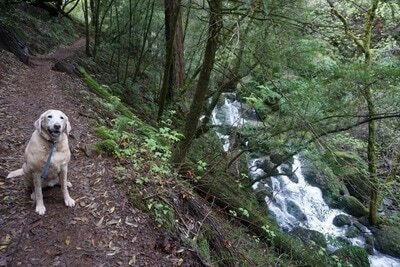 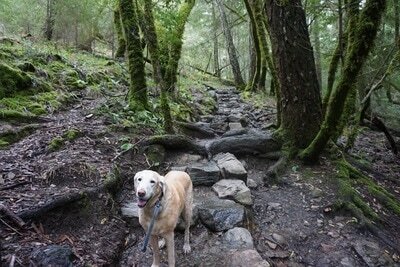 Hike Description: This was probably Bailey's favorite all-time hike, she was running ahead of me until the very end. 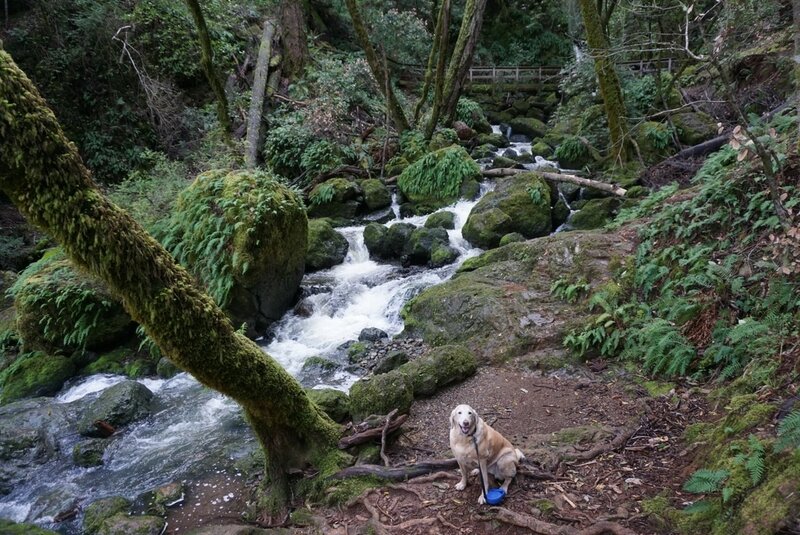 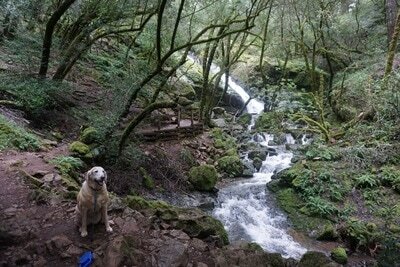 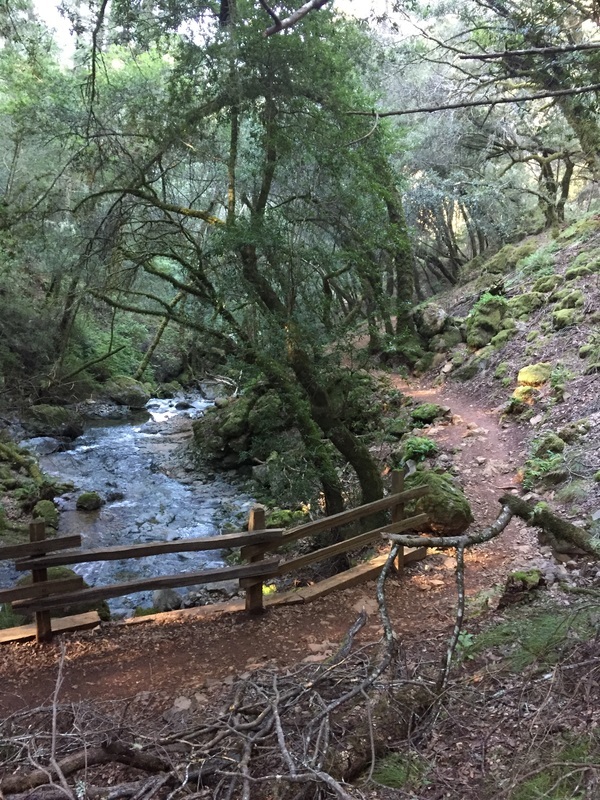 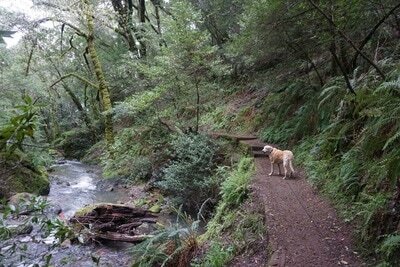 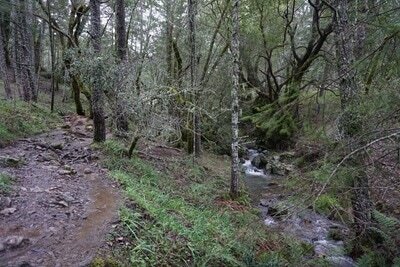 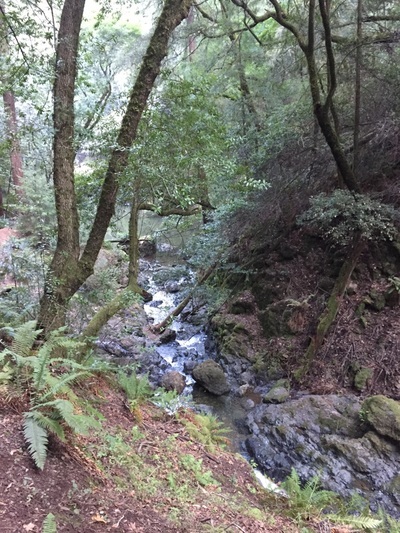 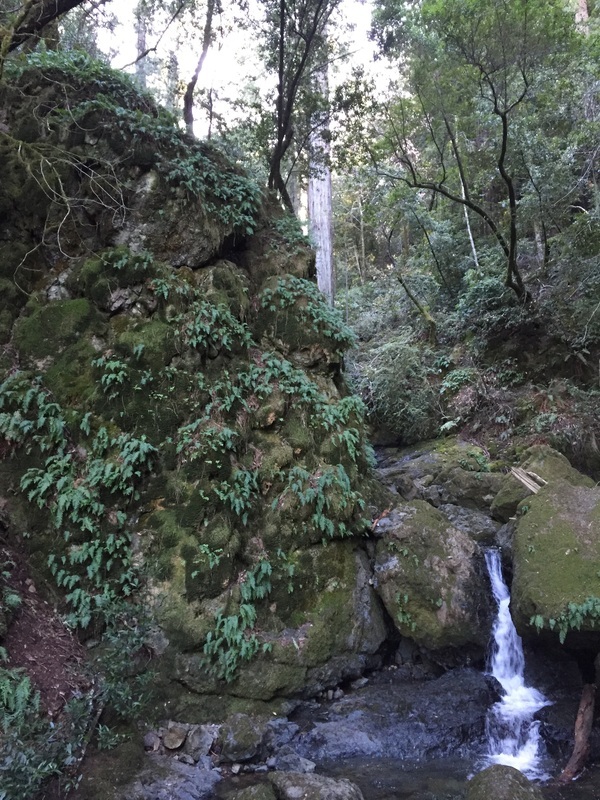 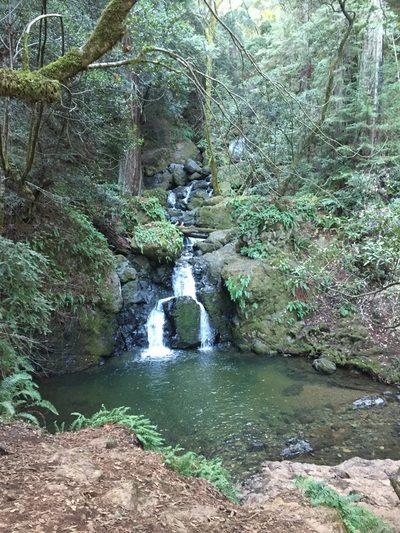 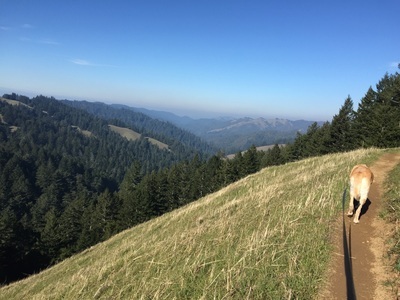 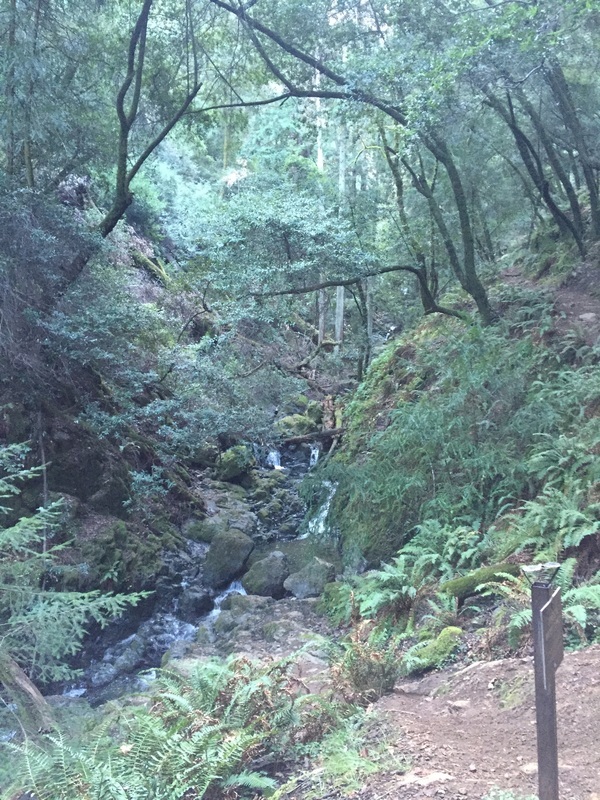 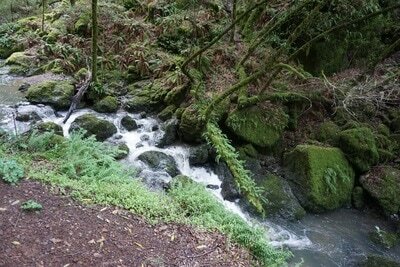 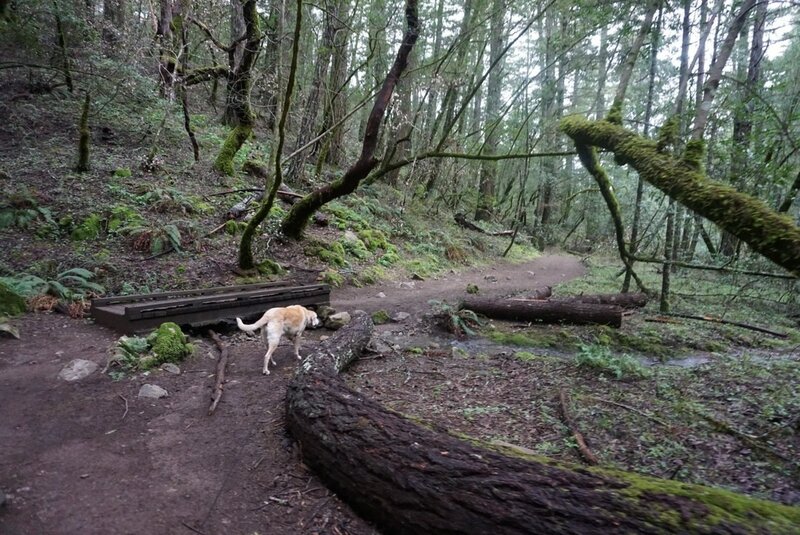 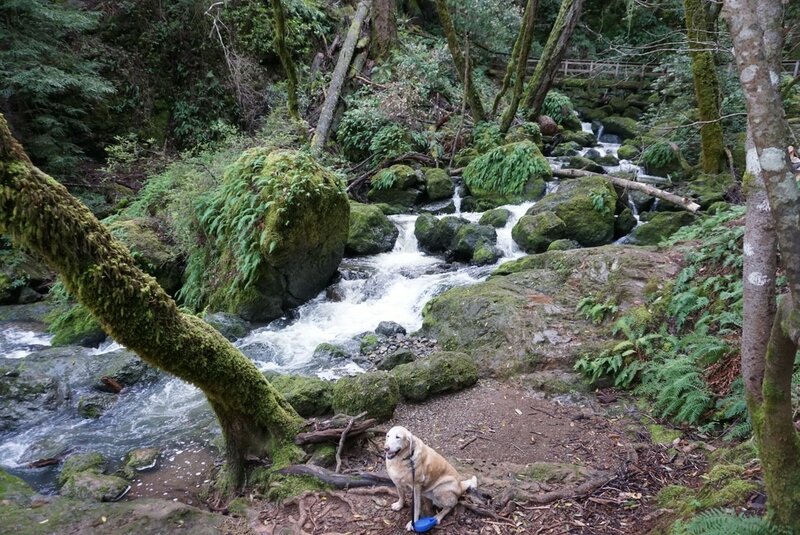 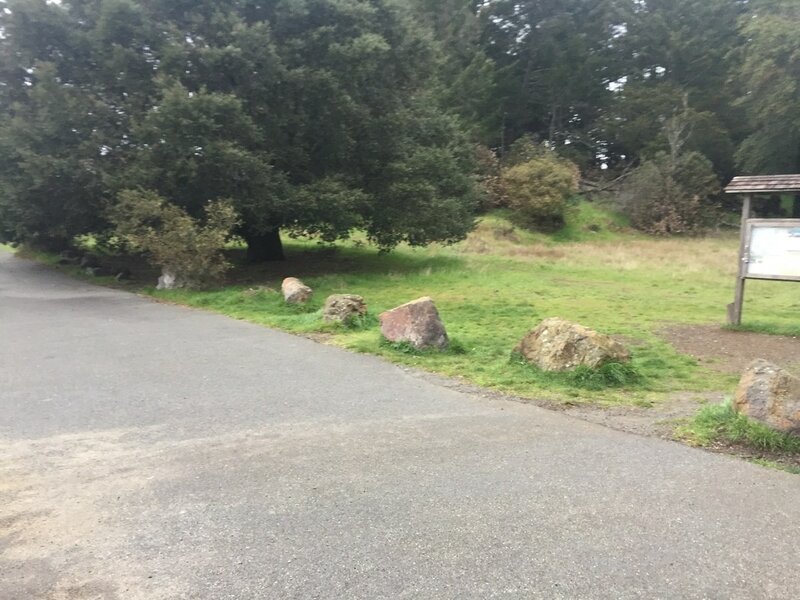 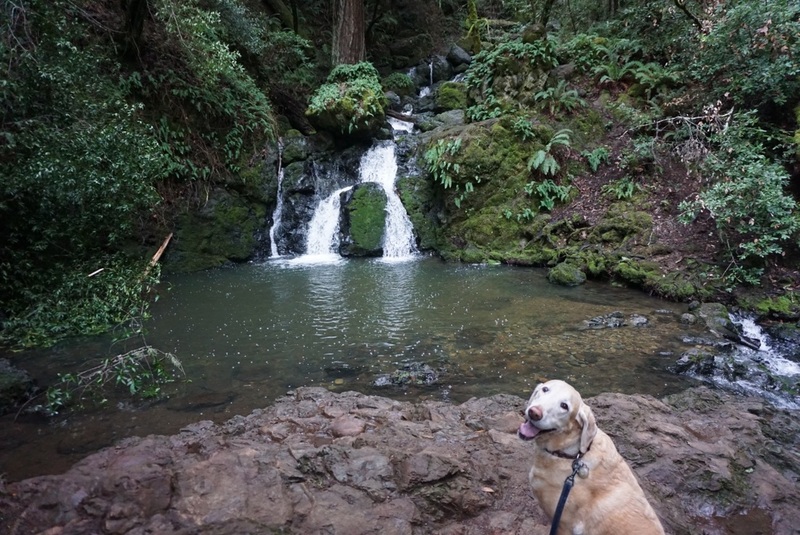 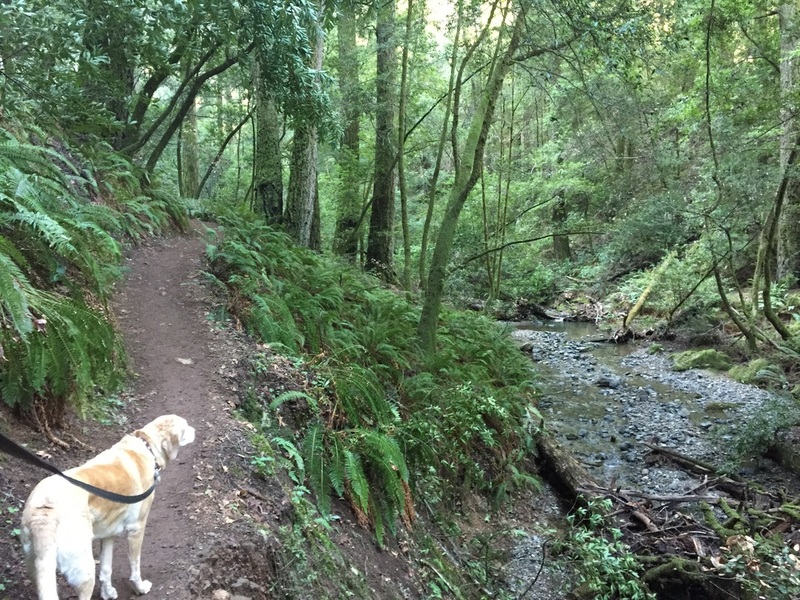 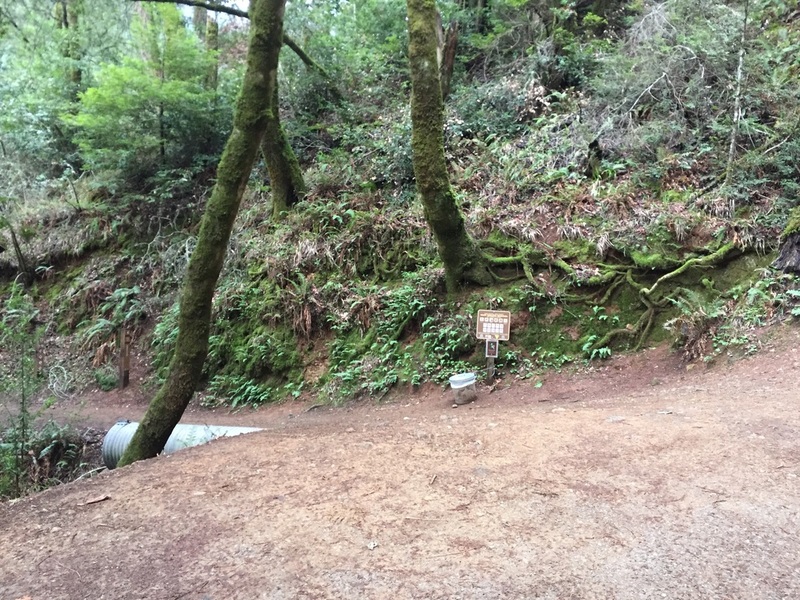 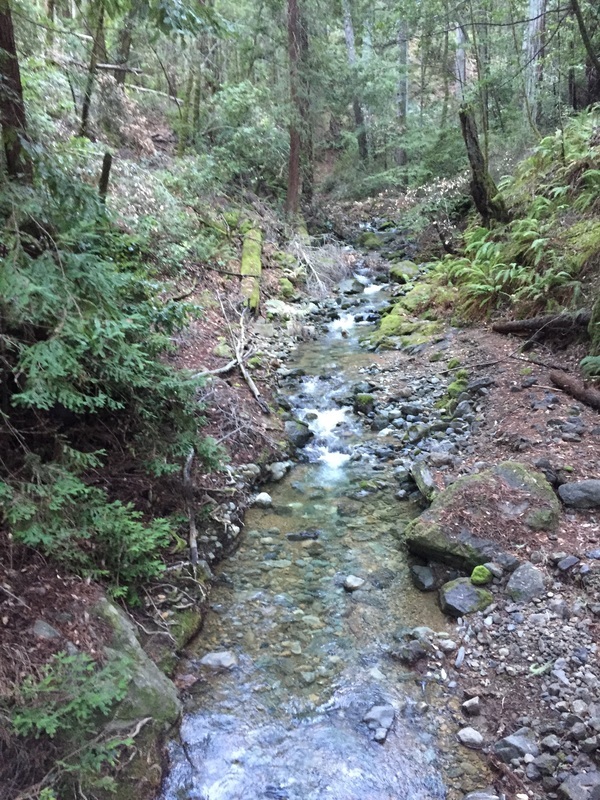 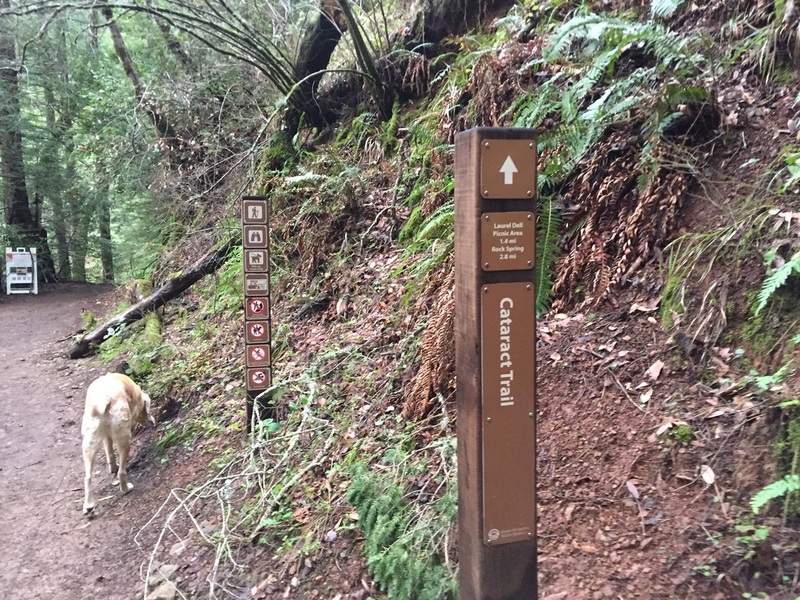 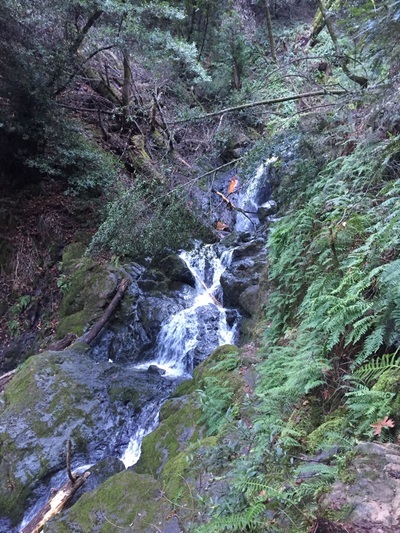 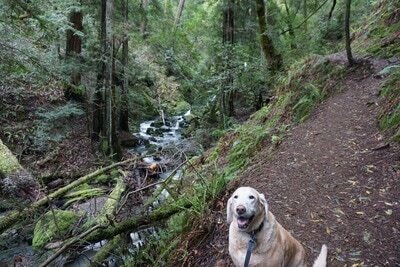 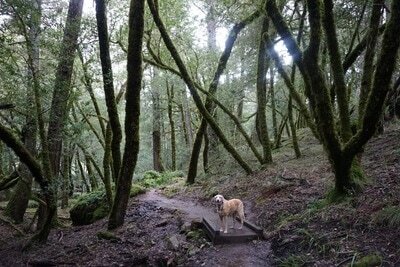 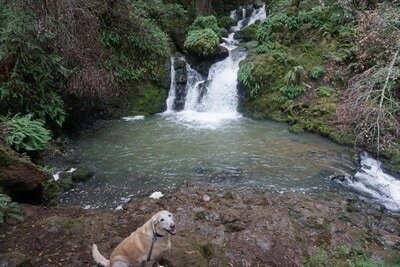 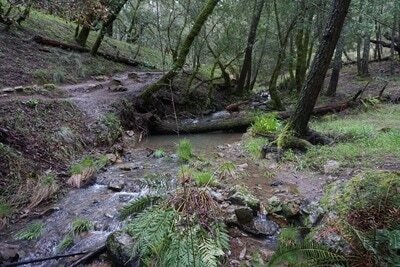 As of February 2017, Fairfax-Bolinas Road is closed, so you must start the hike at the upper trailhead and hike down. 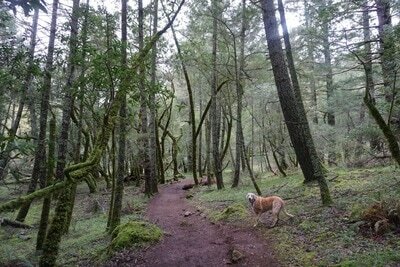 The entire trip, out and back, is roughly a 9-mile hike. 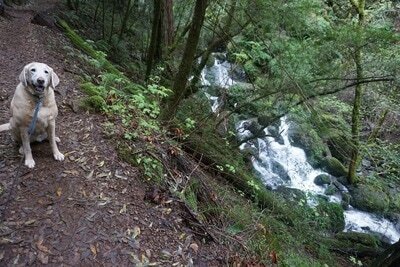 Once the road re-opens, you can hike from the bottom up, which is a much shorter hike, at about 3 miles. 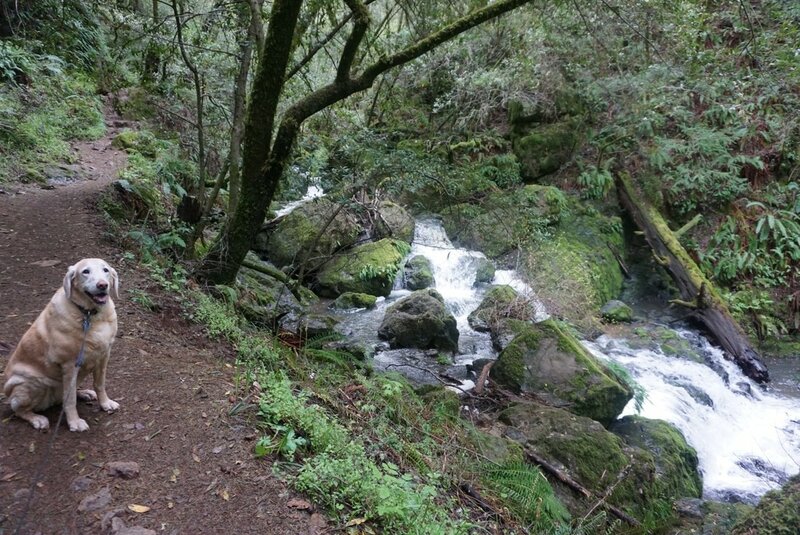 There is also an option to hike a 10-mile loop, described below. 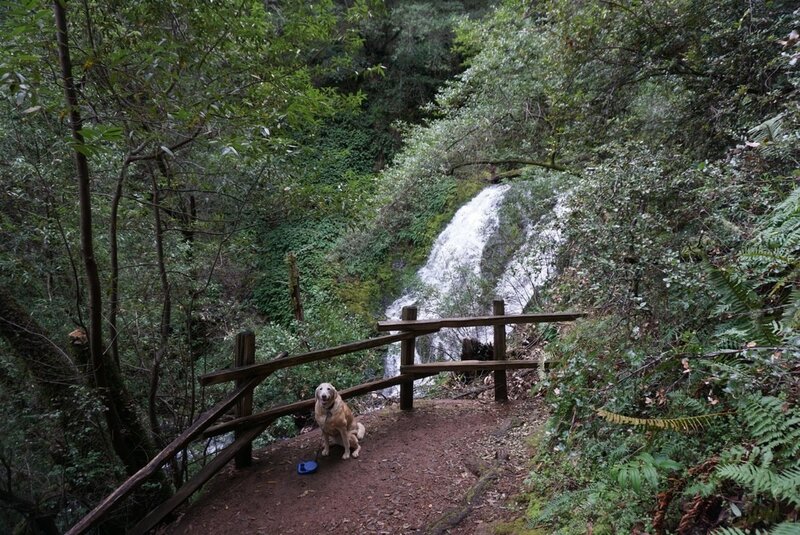 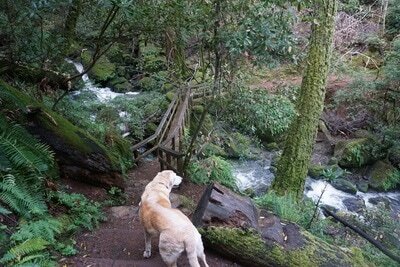 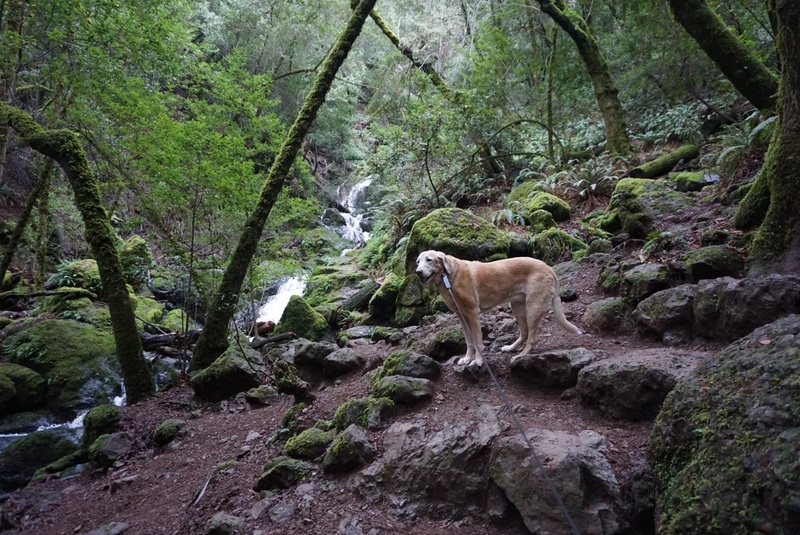 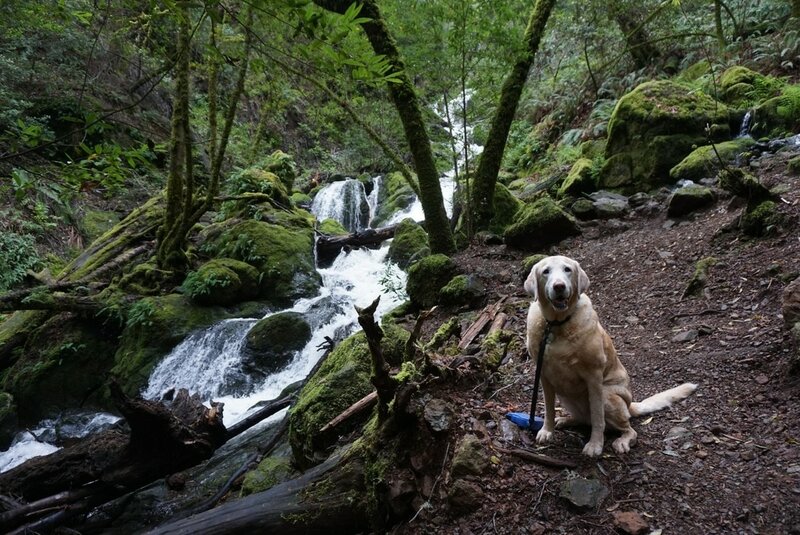 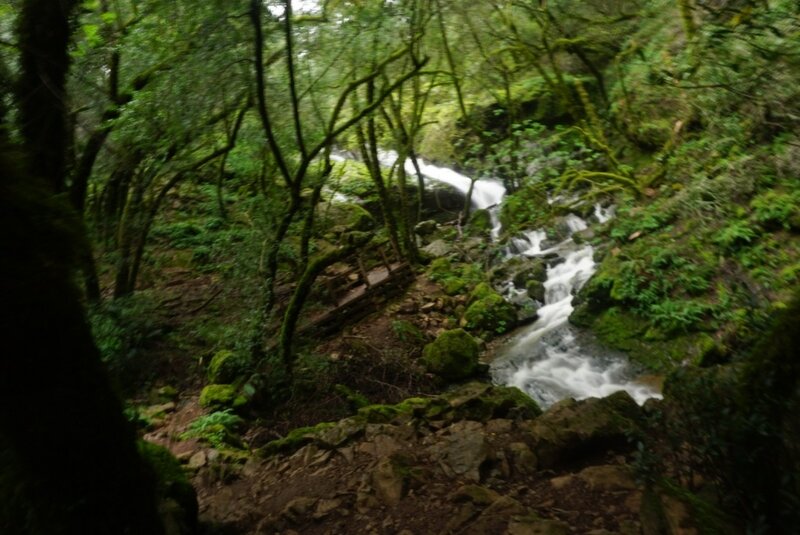 The hike to the falls was nice, with scenic views of the morning fog over lake Alpine, small falls flowing into pools, and well groomed trails. 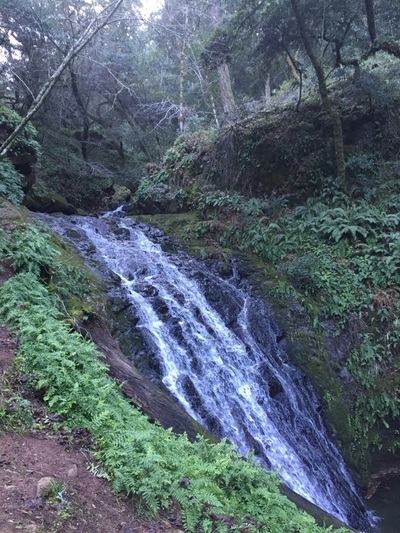 The falls were flowing pretty good, but it had been about a week since it rained, so the actual top of the falls wasn't as breathtaking as I expected. 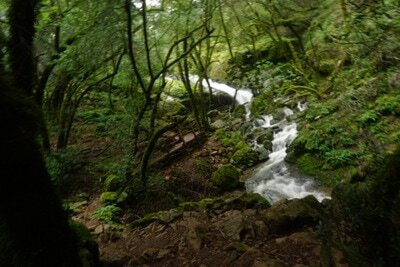 However, the scenery of the entire hike was amazing. 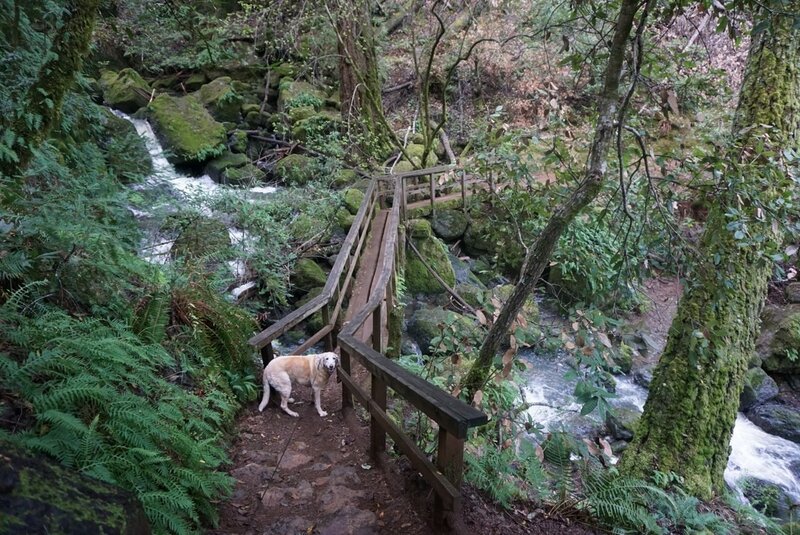 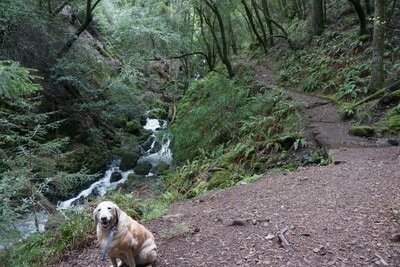 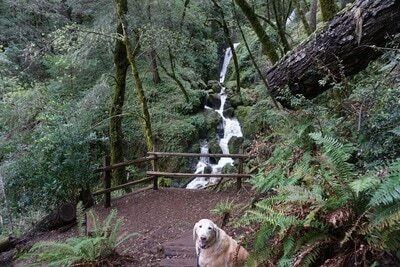 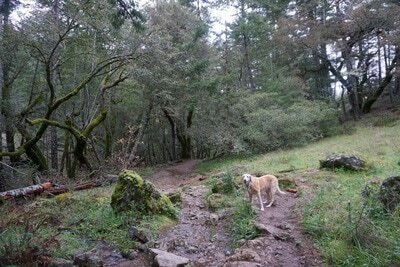 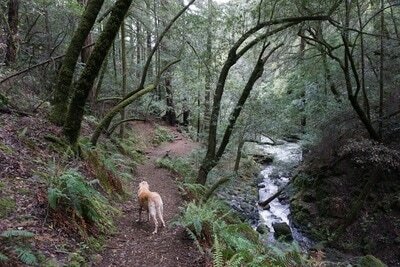 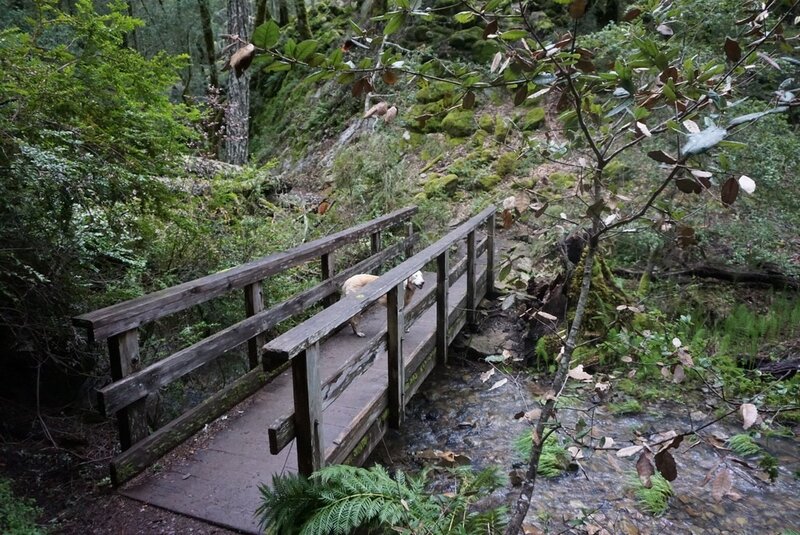 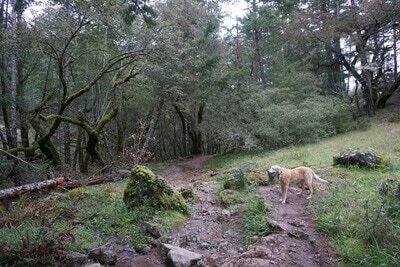 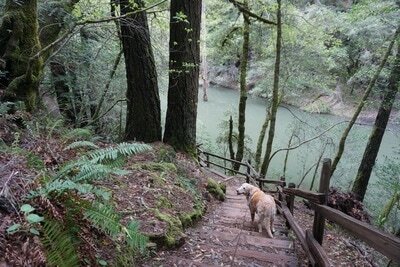 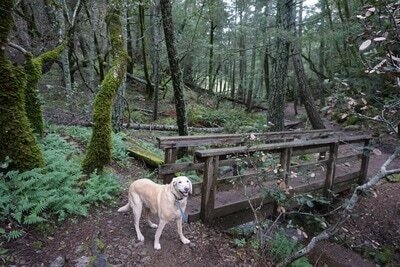 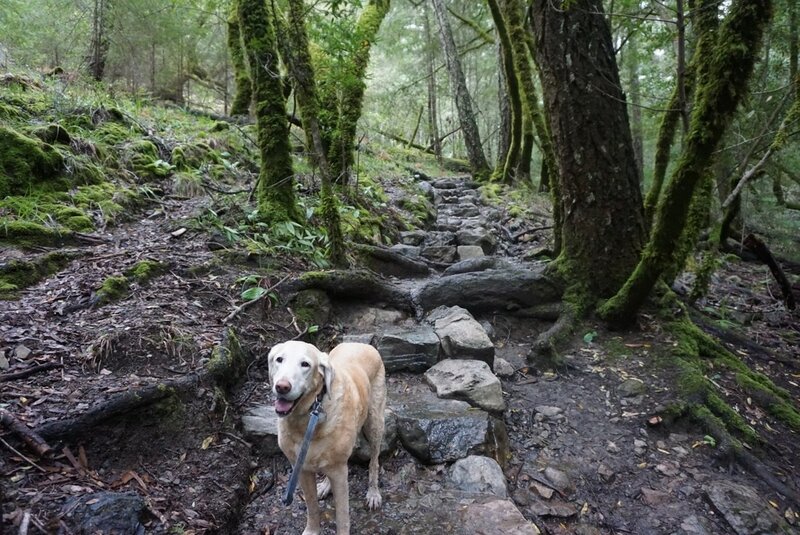 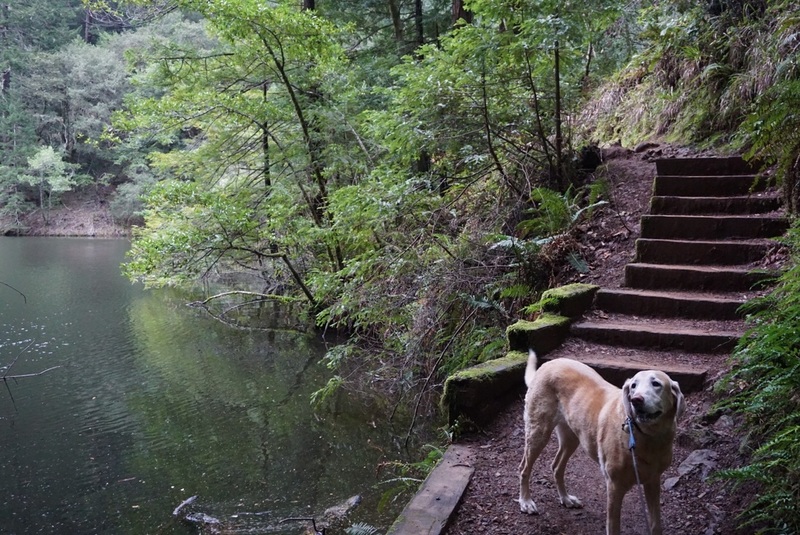 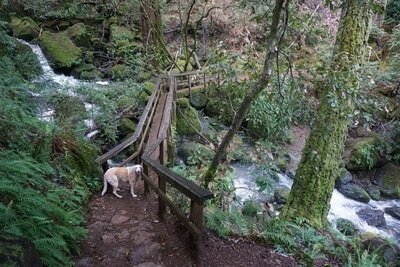 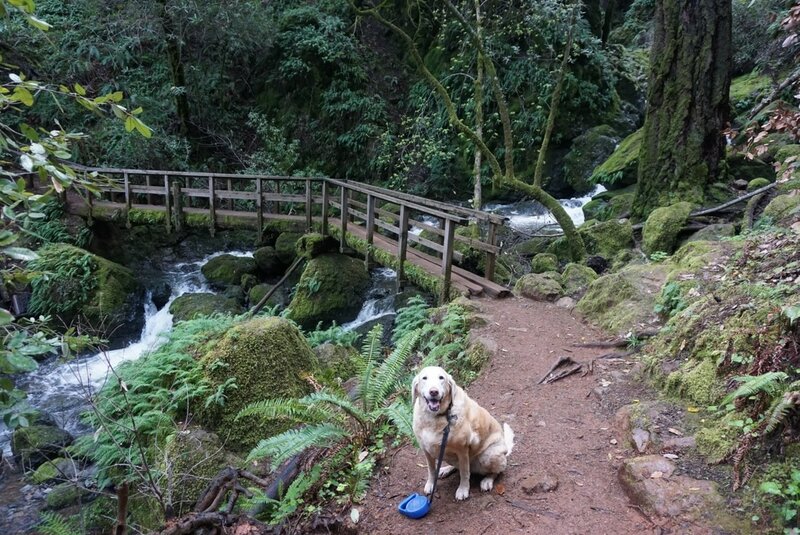 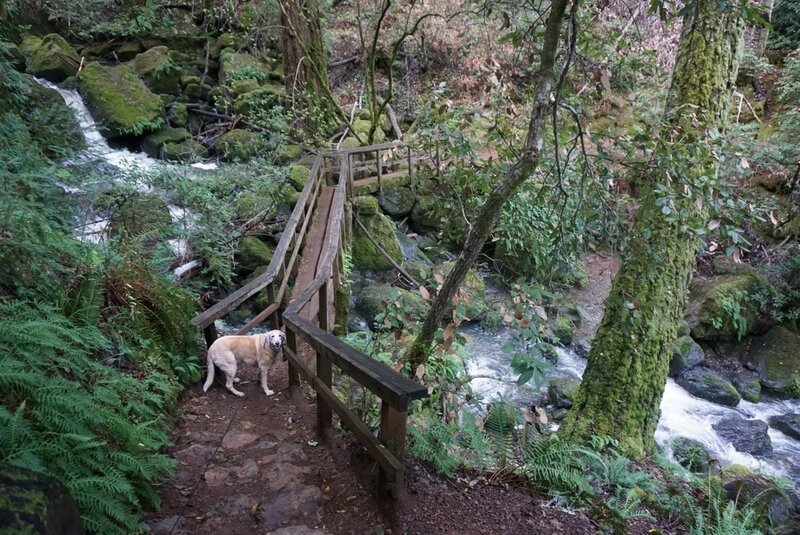 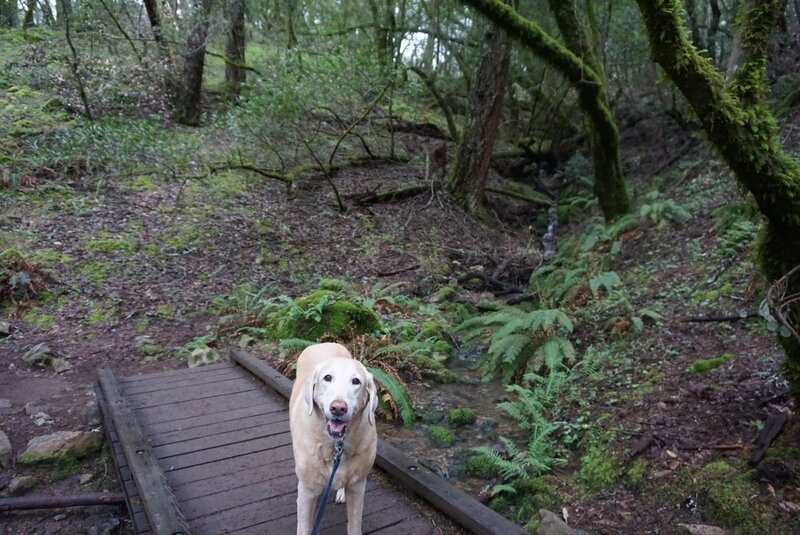 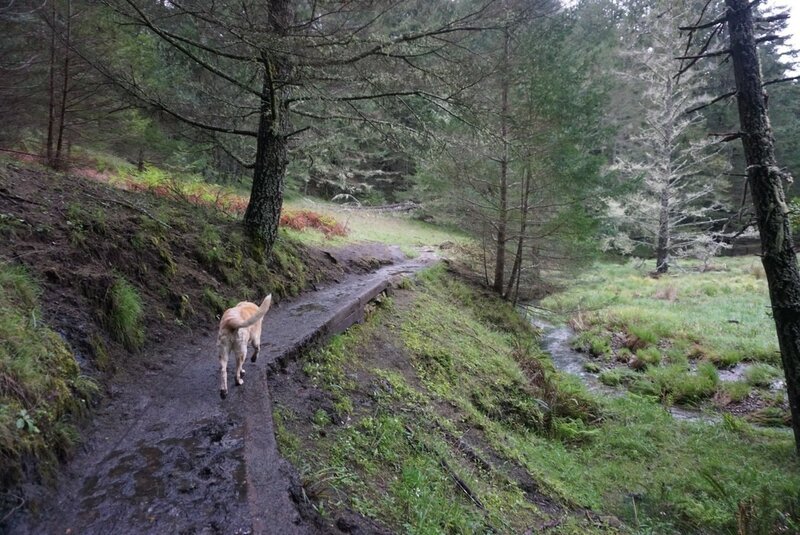 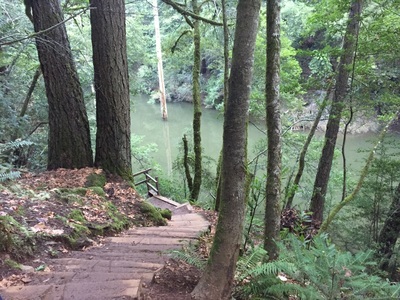 The trails are well maintained, and I enjoyed the bridges and the way the stairs are cut into the hillside. Be careful though, the stairs can get quite slimy/ slippery. Most people only hike to the top of the falls, and although there are a lot of stairs, it's not too strenuous and is only a 3 mile round trip hike. However, we decided to take a loop of the entire park, and I really recommend it because I enjoyed it even more than the hike up to the falls. 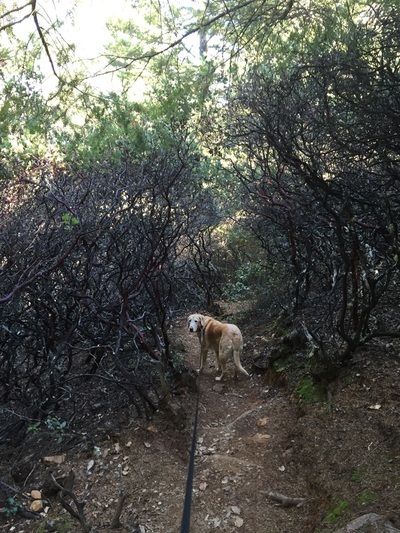 It's not too challenging because there are lot of switchbacks and rolling trails, but it's long. 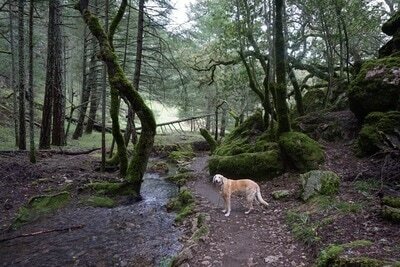 I enjoyed the constant change of scenery. 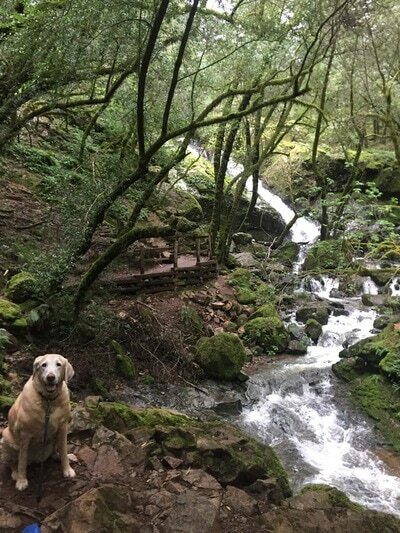 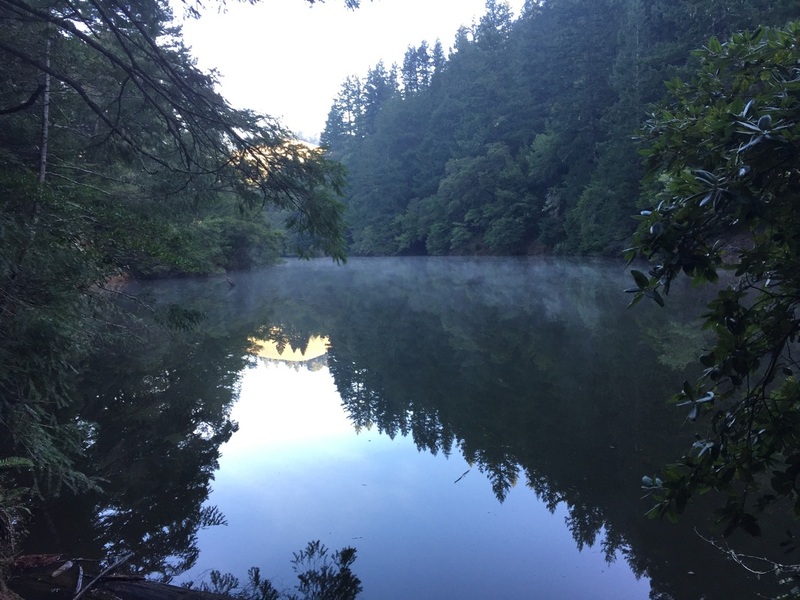 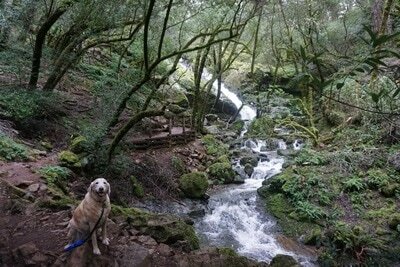 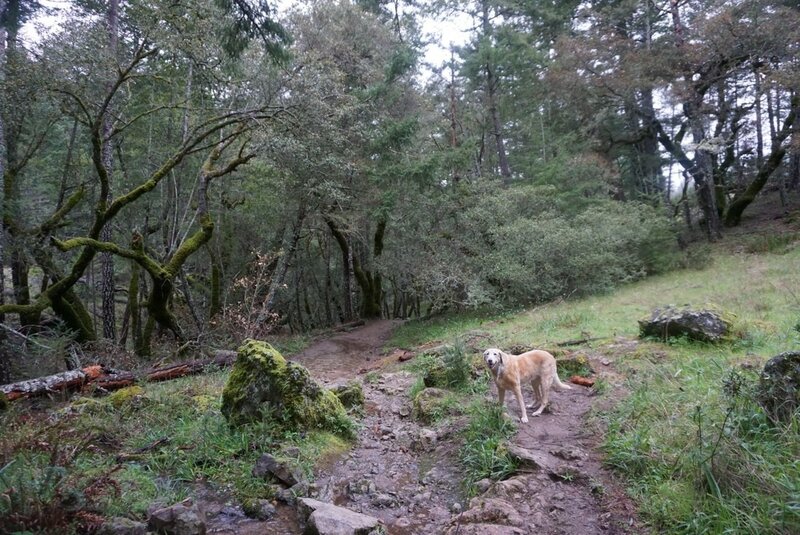 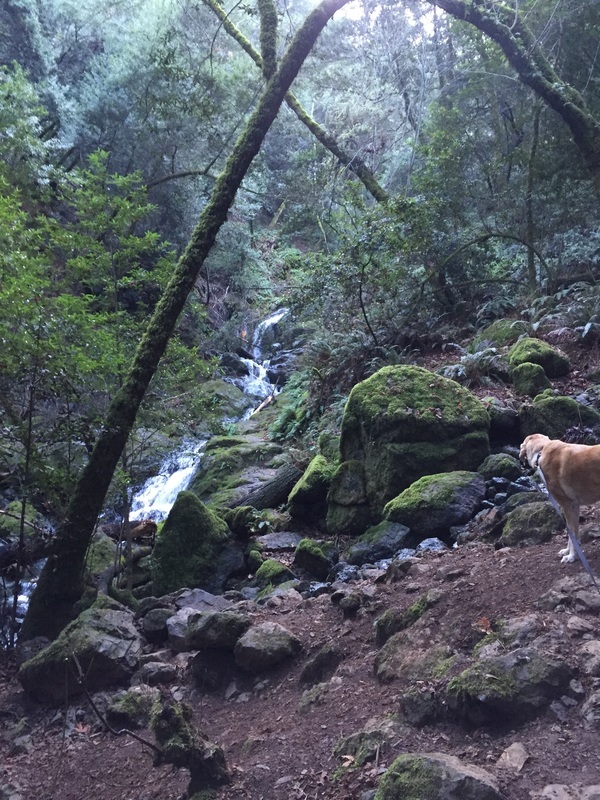 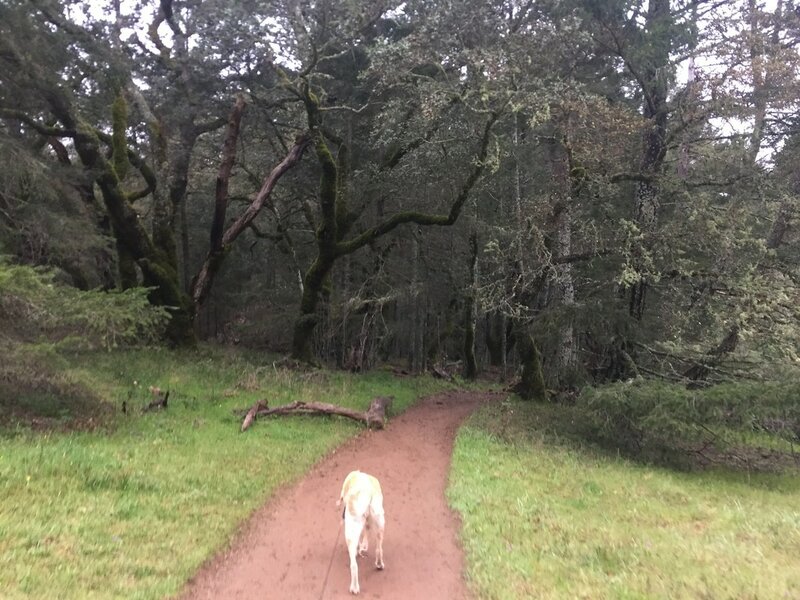 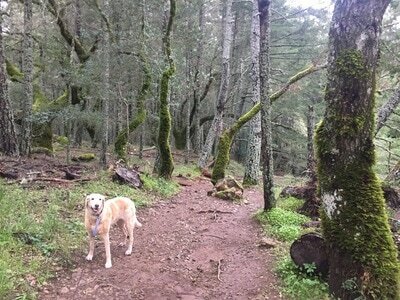 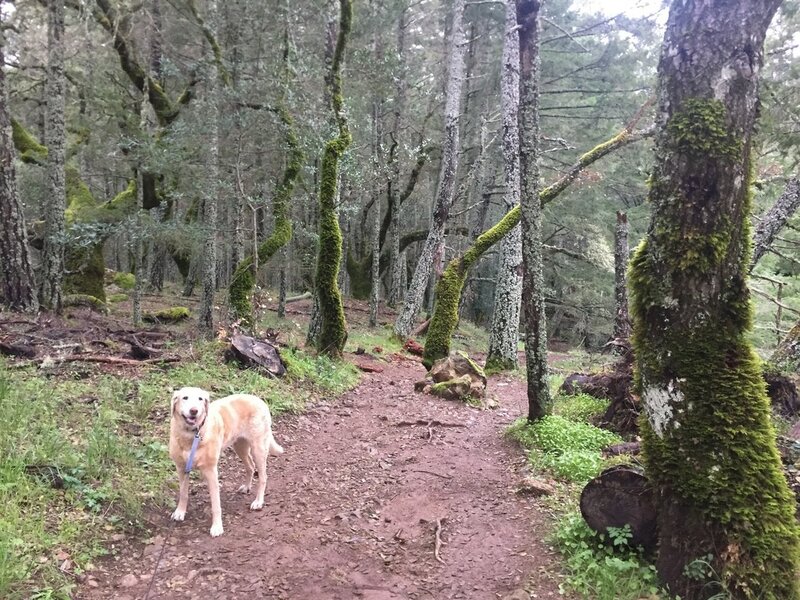 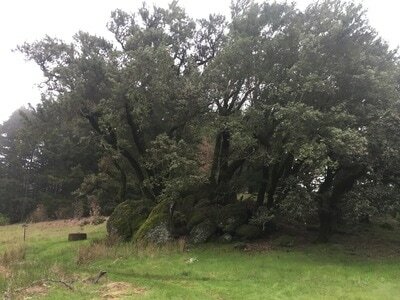 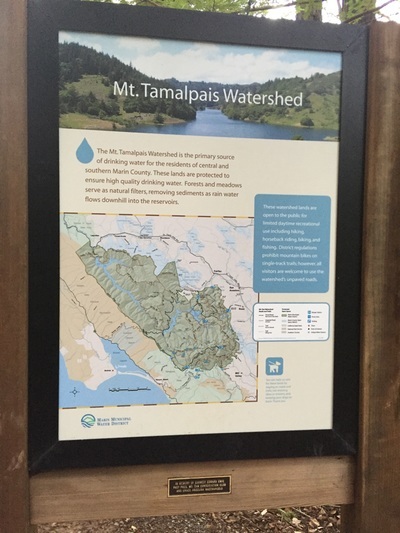 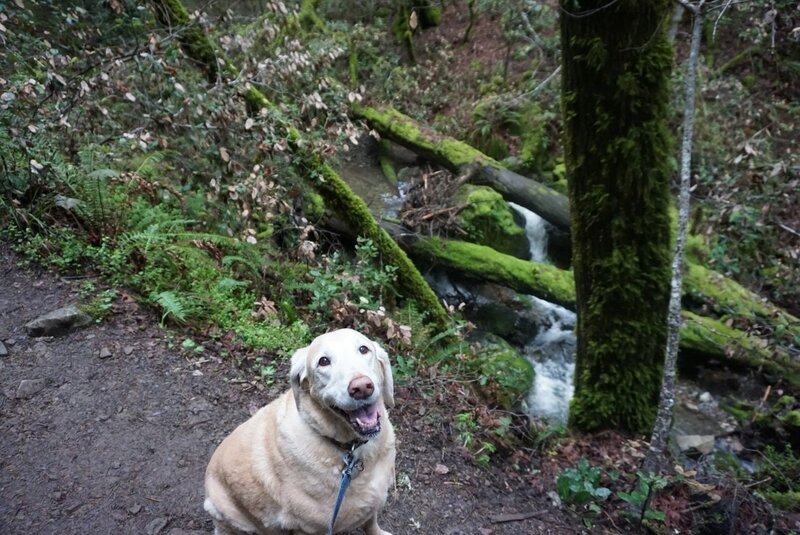 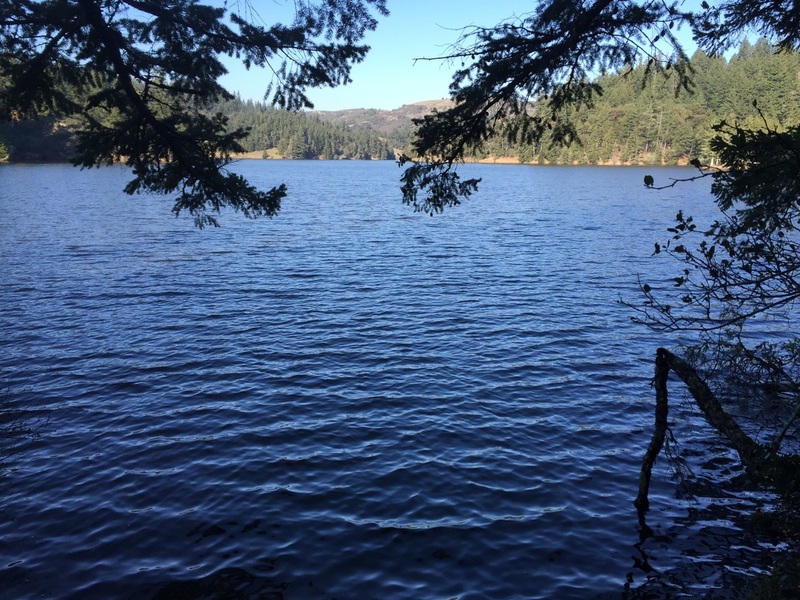 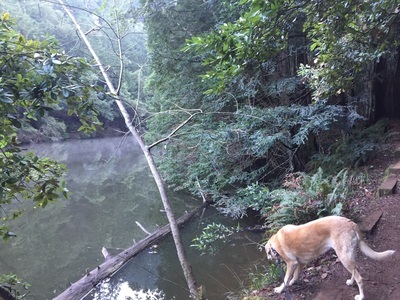 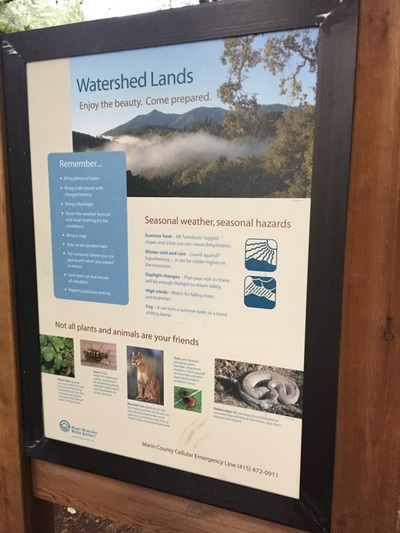 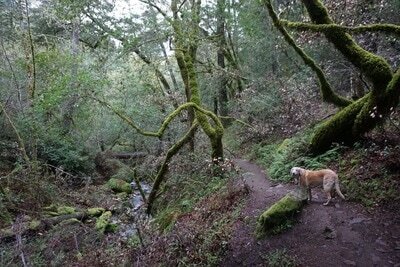 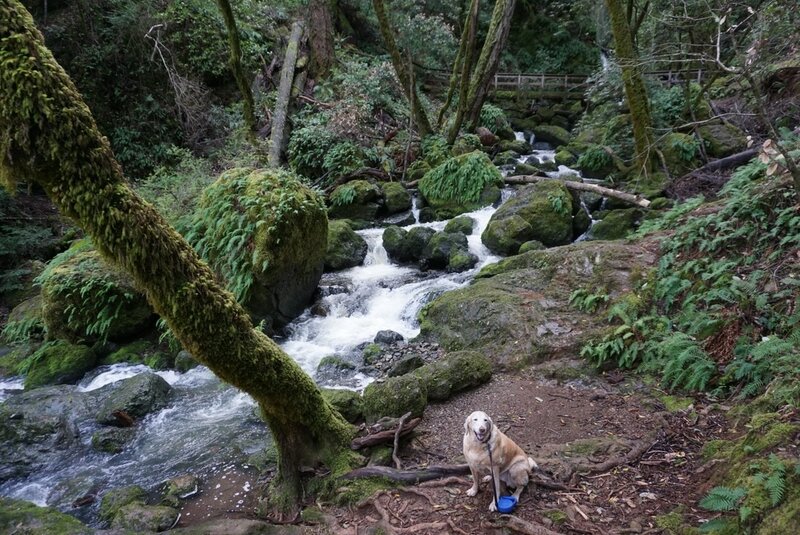 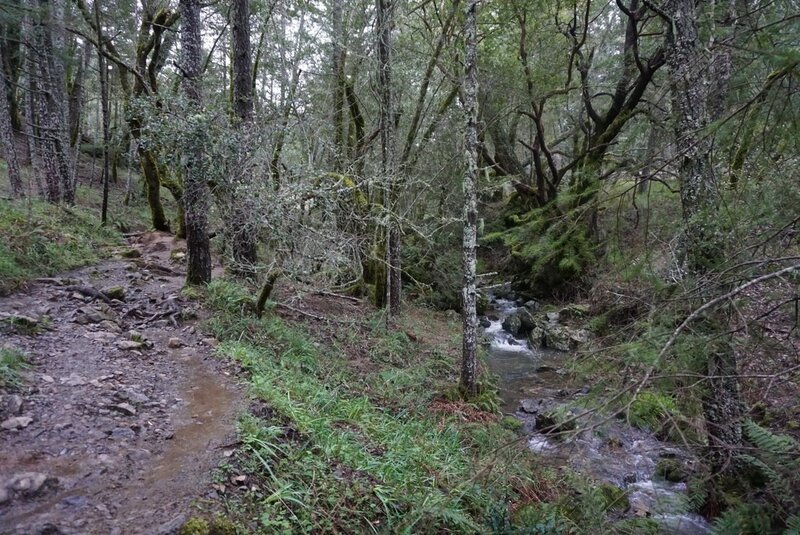 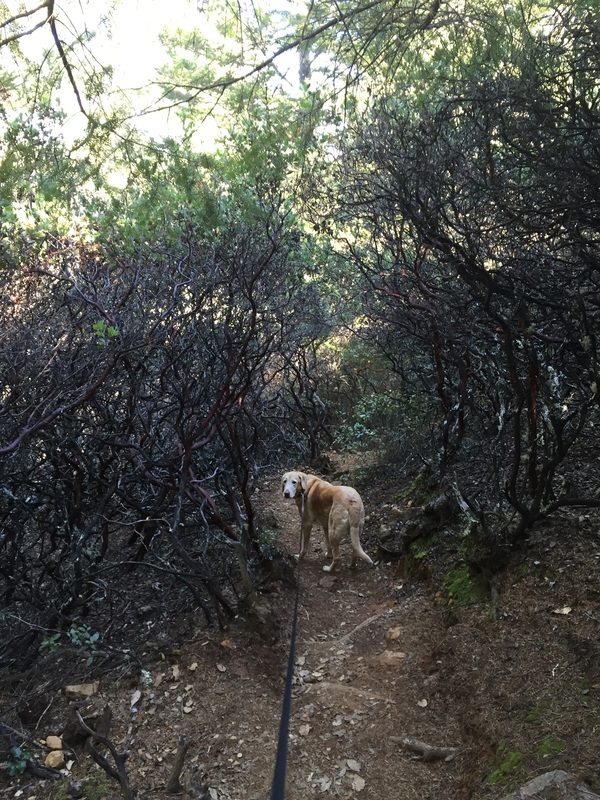 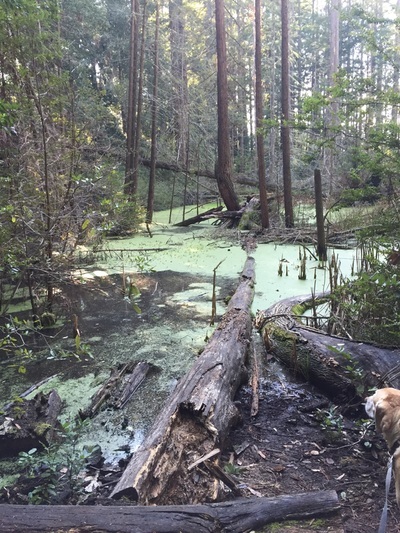 You get great views of the mountains from the top of the hillside, scenic stretches along creeks, trails lined with beautiful swarms of red manzanitas, giant redwoods and an interesting swamp/marsh area. 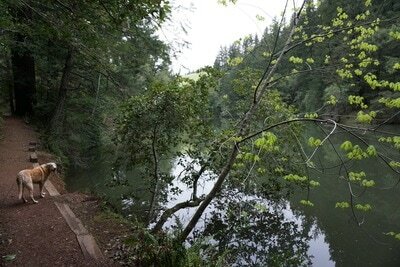 The end of the loop has beautiful views of the lake as it winds back around to where you started. Hiking Instructions: We went from Cataract Falls to the High Marsh Trail, checked out the meadow, and took the Kent Trail to Helen Markt Trail and back to the Cataract Trail. 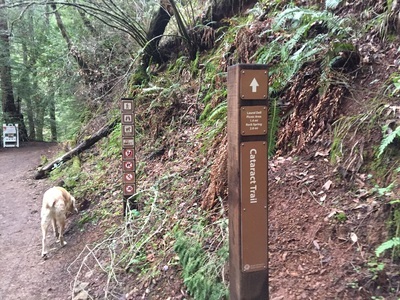 This appeared to be the shortest loop on google maps, but I noticed we passed a few areas which did not have trailhead markers but looked like separate trails. 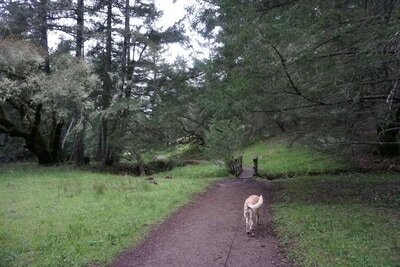 I read that the loop was around 8 miles, but the route we took was about 10 miles, so maybe there's a shorter route. 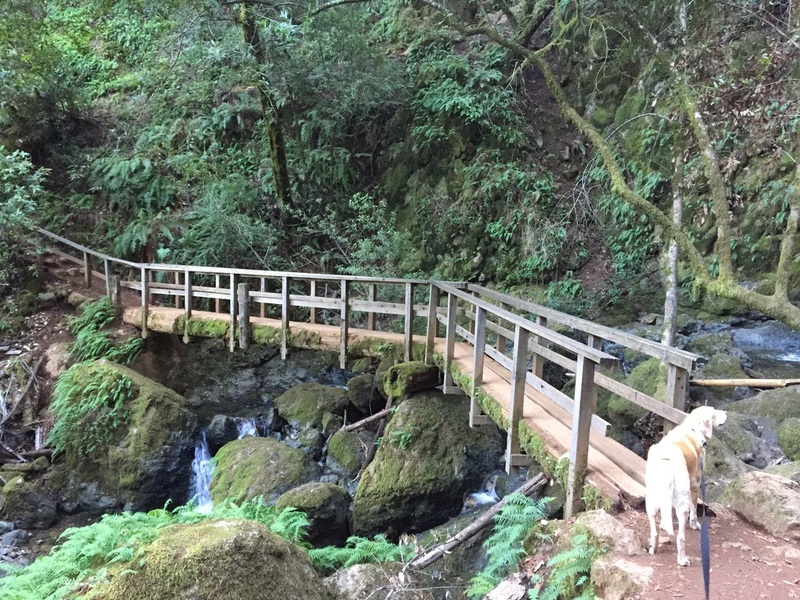 If you're going to do this loop, definitely bring a map along. 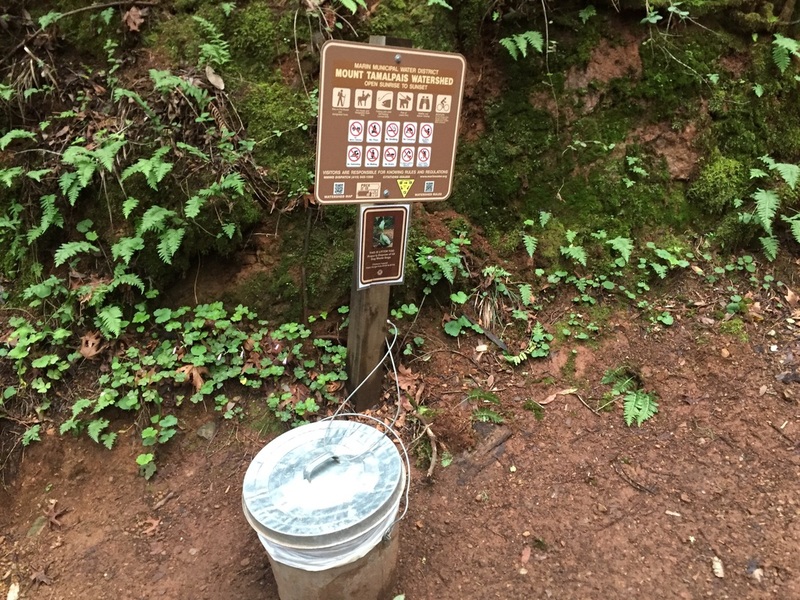 There's a trash can at the trailhead as well as a pit toilet. 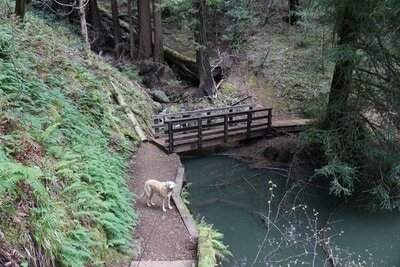 No running water is available, so bring plenty.